This stargazing night has been organized in association with Jyotirvidya Parisanstha (JVP) on Saturday the 30th and 31 st of March, at Nasrapur farmhouse location. 2. 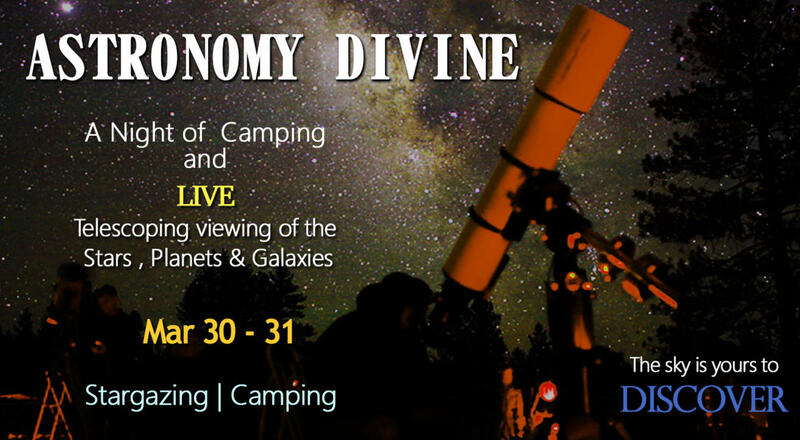 Telescope sessions (total 4): Through JVP’s telescopes, participants will get to see mind-blowing views of the Moon, Saturn, Mars, and some deep sky objects like Orion Nebula, Beehive cluster. 3. Software demo: One of our experts will demonstrate a free planetarium software that you can use with your laptops, tablets or cellphones. 4. Fun time: Astro-antakshari/word puzzle. 5. We’ll also get to see some bright satellite passes (and hopefully meteors!) with an unaided eye! If you like seeing yourself as part of a bigger picture, with a sense of wonder, and just loves being out at night. If that's you come and join us for a slumber party under the stars.